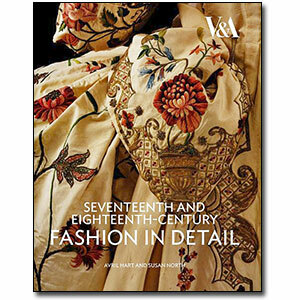 This book is part of the the acclaimed Fashion in Detail series from the Victoria and Albert Museum in London. It reveals the decorative seams, exquisite stitching, voluptuous drapery, strict corseting and slashing and stamping that make up the clothing in seventeeth- and eighteenth-century fashion. Seventeenth and Eighteenth-Century Fashion in Detail is an inspirational resource for students, designers, collectors and all followers of fashion. Using an authoritative text, exquisite colour photography and line drawings of complete garments, you are allowed the unique opportunity to look closely at clothing, often too fragile to be on display. Avril Hart is an expert in historical dress. Her published work includes Englishmen's Fashionable Dress: 1600-1799, Ties, and Fans. Susan North is Curator, Department of Furniture, Textiles and Fashion, at the Victoria and Albert Museum in London.